Manchow Soup Recipe (Veg Manchow Soup) | Cook Click N Devour!!! Manchow soup recipe with step by step photos. Sharing a delicious and healthy vegetarian variation of the popular Chinese manchow soup. This vegetable manchow soup is prepared with mixed vegetables and is very delicious. Is is served with fried noodles and spring onion greens. Veg manchow soup is a very popular vegetarian indo chinese soup that you will find in all restaurants as well as street shops. veg manchow soup recipe is basically a concoction of mixed vegetables simmered in veg stock or water thickened with corn flour. The seasoning is more than just salt and pepper, good dose of soy sauce, chili sauce, vinegar are added and that makes this veg manchow soup very flavorful ad delicious. I made this veg manchow soup recipe few months back when days were very cold. This is a very comforting healthy soup, the ones you get in restaurants tend to be somewhat pasty and very thick, but when making manchow soup at home you can keep the thickness as per your preference, add less cornflour and make a healthy soup. Also while making at home you can avoid ajinomoto. Compared to many other creamy and rich soups, I would say his veg manchow soup is good one is keeping you full yet light. To make veg manchow recipe, you can add all the vegetables that go in the making of veg fried rice. It will be a good idea to chop some extra veggies and save for making veg manchow soup recipe while you chop vegetables for fried rice. 2. I have tried this soup topped with roasted puffed rice, it was good too. Serve veg manchow soup piping hot, you can serve this as starter with veg fried rice, noodles too. 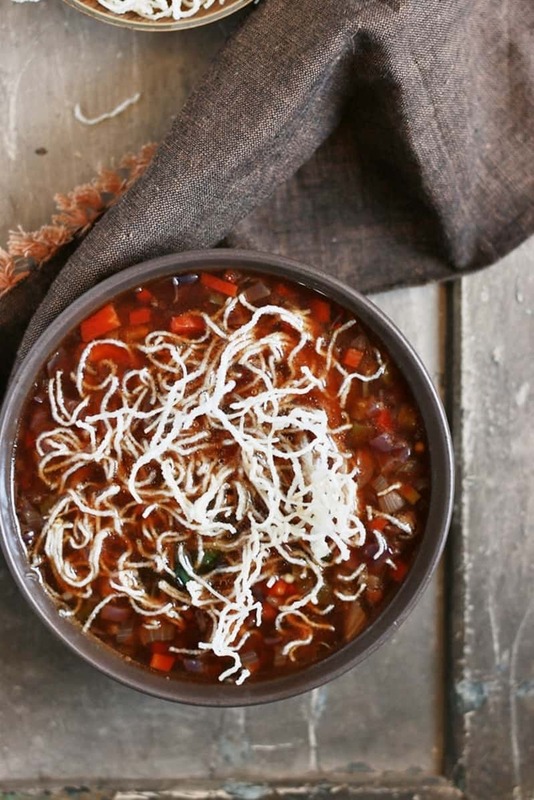 Here is how to make veg manchow soup recipe, do try this healthy and easy soup! Veg manchow soup recipe with step by step photos. 1. Heat 2 teaspoons sesame oil in a deep pan. Once the oil starts to smoke add chili flakes and reduce the flame. Saute the chili flakes well till they turn dark. 2. Add minced garlic and saute well. Add chopped spring onion whites and stalks. Saute well till color changes slightly. 3. Add chopped vegetables and mix well. Saute for few minutes till the veggies turn slightly soft. 4. Add soy sauce, chili sauce and mix well. 5. Add 3 cups water and bring to a rapid boil. 6. Dissolve 2 tablespoons corn flour in 1/4 cup water and add to the boiling broth. Continue to cook for 10 minutes. 7. In the meanwhile deep fry instant sevai or roast puffed rice or prepare fried noodles. 8. Now add salt and pepper powder to the soup and simmer for 5-7 minutes. 9. Once the soup has reached the desired consistency, remove the soup from flame. Add spring onion greens and serve veg manchow soup hot topped with fried noodles. Heat 2 teaspoons sesame oil in a deep pan. Once the oil starts to smoke add chili flakes and reduce the flame. Saute the chili flakes well till they turn dark. Add minced garlic and saute well. Add chopped spring onion whites and stalks. Saute well till color changes slightly. Add chopped vegetables and mix well. Saute for few minutes till the veggies turn slightly soft. Add soy sauce, chili sauce and mix well. Add 3 cups water and bring to a rapid boil. Dissolve 2 tablespoons corn flour in 1/4 cup water and add to the boiling broth. Continue to cook for 10 minutes. In the meanwhile deep fry instant sevai or roast puffed rice or prepare fried noodles. Now add salt and pepper powder to the soup and simmer for 5-7 minutes. Once the soup has reached the desired consistency, remove the soup from flame. Add spring onion greens and serve veg manchow soup hot topped with fried noodles. 1. You can add mushrooms along with vegetables. Superb comforting bowl of veg manchow soup. Looks delish.